As with ever modification on my site, THIS IS FOR OFFROAD USE ONLY, and you(the reader) are responsible anything that may happen by using this information. 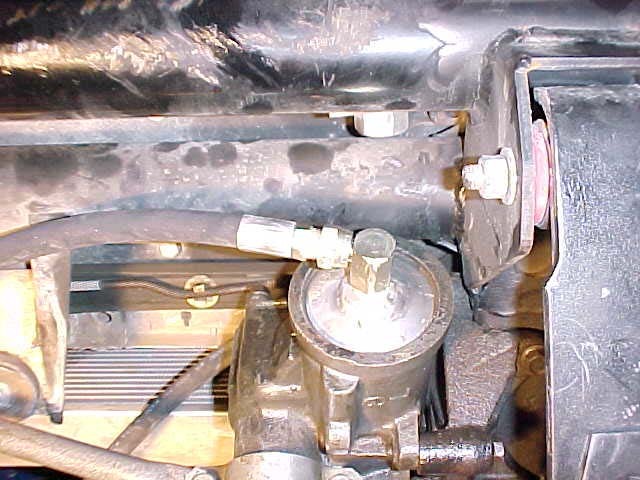 This is the way to make your own power steering system into a Hydraulic ram assisted system like the ARG "Rock Ram" and save hundreds of dollars. This frist section deals with the modifications to the steering gear box. The power steering gear has a piston with a rack gear on the side and that is what gives the boost. AGR taps in at the valve for their hydraulic assist. I tap on both sides of the cylinder because it was easier (and I did not understand the valve portion yet). I tapped my box in the two aluminum plates on it. One is on the front end of the box and the other is where the adjustment for the steering lash is. These two locations are on ether sides of the cylinder. For the top cap, you have to take the adjusting lock nut off and then the four bolts that hold it on and screw it off of the adjusting stud. Then drill and tap a hole beside the adjusting stud (look for a small recess on the bottom side) and try to hit that spot. The cap end you need a punch to knock the retaining ring out. There is a small hole somewher around the body of the gear on that end. If you find that hole and drive a punch in it, it will drive the retaining ring out enough that you can grab it with pliars and pull it out. Unlike the adjusting cap this end cap is thin so I would weld a 1/4" thick piece of aluminim to the end cap and then drill and tap the hole through it just like the other cap. I used a 2" cylinder with an 8" stroke from Northern Tools. 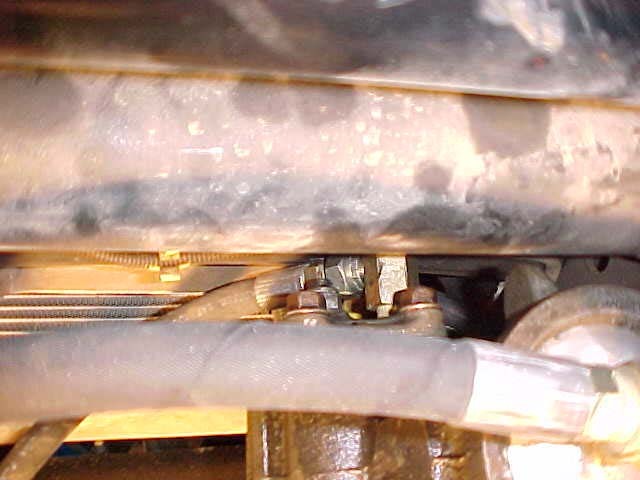 The cylinder has to extend and/or compress before exceeding the original travel of the tie rod. To measure the stoke you need turn the wheels to lock one way and measure from some point on the tie rod to the side of the spring. Turn the other way and subtract the difference and that is the stroke cylinder that you need. When you get your clinder set like you want it and it is stroking out both ways I suggest that you remove your steering stops because now your cylinder is your stops. Local hydraulic shop should be able to make your lines and provide the fittings, or you can get everything from a Northern Hydraulics cataloge, they are on line. 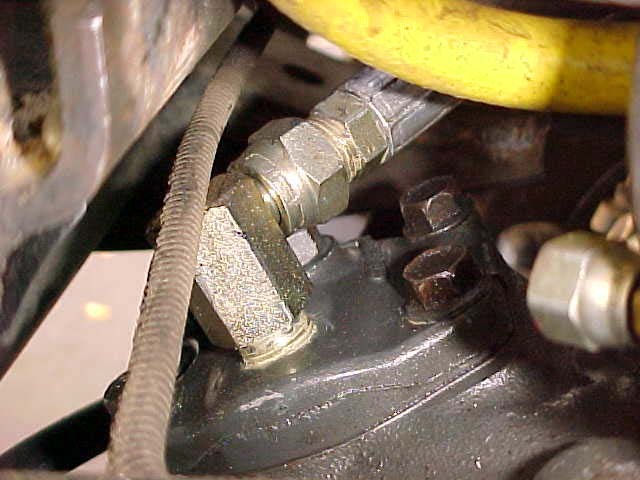 Run lines from the steering gear down to your cylinder. Start the vehicle and DO NOT PULL HARD ON THE WHEEL, YOU VERY WELL COULD HAVE THE LINES CROSSED and with the tires off of the ground the wheels should drift from center to one side on there own. If you try to turn the wheel and there is resistance stop and switch your lines. 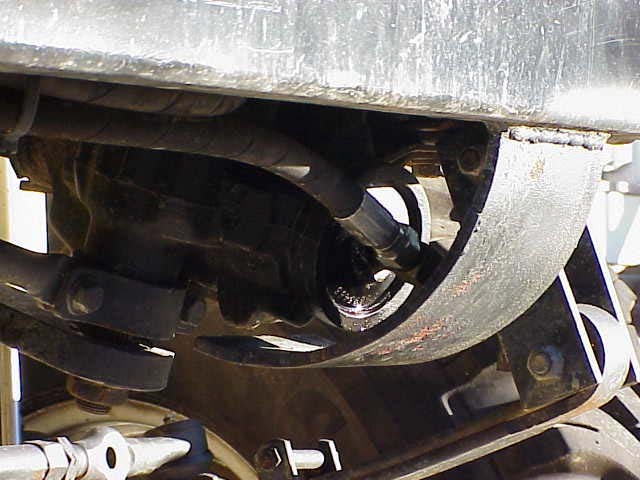 PROTECTION: Especially Jeeps, put a skid plate over the end of the gear box. You do not want to hit that fitting. I suggest a big cooler and additional resevoir capacity. The bigger the cylinder the slower it turns but the stronger it is. I would not go over a 2 in bore cylinder.